The Ultimate Chapter In The Haarlock's Legacy Trilogy! The infamous Rogue Trader, Erasmus Haarlock, is set to return, and only the Inquisition stands in the way of his dark revenge. 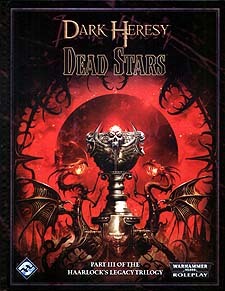 This book is the final conclusion to a definitive trilogy of epic Dark Heresy adventures. The adventure takes Acolytes to the forbidden ice world of Mara and the haunted planet of Dusk. Old enemies and allies join the struggle on both sides - will the Acolytes be able to survive the terrible conclusion to the Haarlock's Legacy trilogy?